We only employ carefully selected, expert installation teams to maintain the Premier Windows Ltd standard. Our teams will prepare the site to ensure minimal interruption and mess. Dust sheets will be used to cover the working area to avoid any damage or mess to your contents and/or property. They will also vacuum after themselves to ensure your property is left the same way they find it. As each installation is different, installation times vary. At Premier Windows we take pride in a job well done and as such, we won’t sacrifice quality for quickness. On average, a window can take anywhere from 3 – 8 hours to install, but please be advised this is only an approximation. When we have completed the work, all existing frames and rubbish will be removed leaving you with a clean and tidy home. You’ll also be pleased to know that we don’t employ high-pressure salespeople or use cold call tactics. The majority of our work is generated through customer referrals. By working together with Premier you will also experience an excellent pre and after sales service. Your desire for your home will be different to anybody else. We appreciate this and treat our customers like people and not transactions. You can expect our team to deal with you on a personal level and offer products and service that meet your requirements, style and budget. 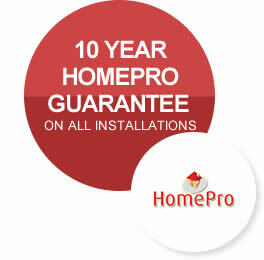 And to ensure you are totally happy with your investment we give you our HomePro 10 year guarantee on all of our installations. If you require a customised solution or general assistance, we can help you by offering our advice and expertise on noise reduction, security, styles, options, maintenance and building regulations. Feel free to call us on 020 8683 4446.